Penny Auction Factory - Creating penny auctions with Joomla! 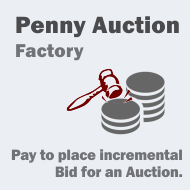 You can test Penny Auction Factory by clicking the menu on the left, and check out the administrative backend by clicking on the menu on top. which describes in detail, all available features and settings of the extension.